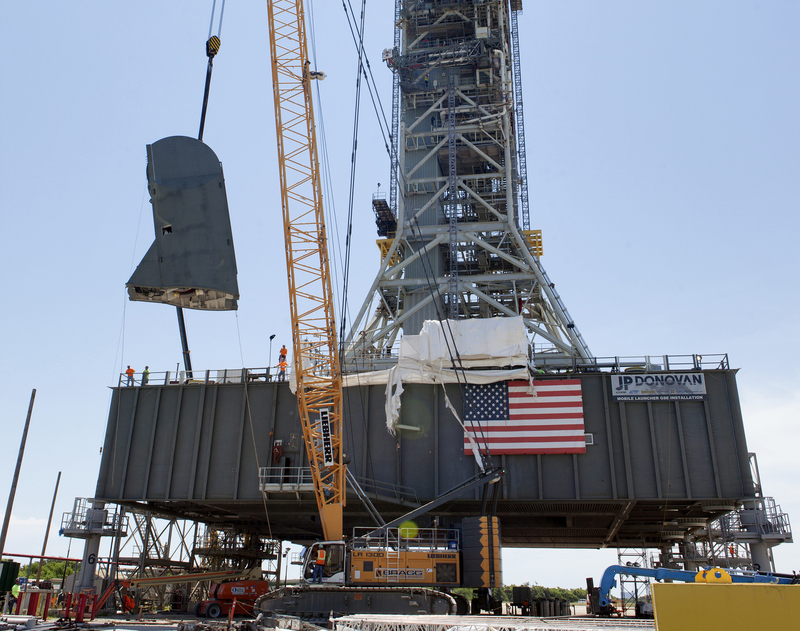 The first of two 35-foot-tall Tail Service Mast Umbilicals (TSMU) was lifted up and installed on the 0-level deck of the mobile launcher at NASA’s Kennedy Space Center in Florida. The installation brings the Exploration Ground Systems Program one step closer to supporting prelaunch operations for the agency’s Space Launch System (SLS) rocket and Orion spacecraft on Exploration Mission-1. The TSMUs will connect to the SLS rocket core stage aft section and provide liquid oxygen and liquid hydrogen fluid lines and electrical cable connections to the core stage engine section to support propellant handling during prelaunch operations. This TSMU will provide the liquid oxygen. Before launch, the TSMUs will tilt back to ensure a safe disconnect and retraction of all umbilical hardware away from the rocket during liftoff.